Home » Service Manual Catalog » OCE Service Manuals » SM_OCE9400 I have paid for Reset Key but not received yet. This manual describes basic functions, theory of electrical and mechanical operations, maintenance and repair procedures of OCE 9400 and also has Parts List and diagrams. 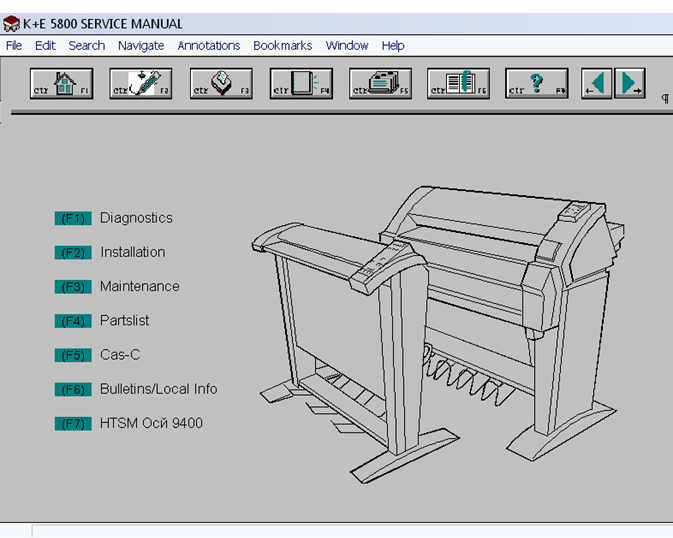 Why should you use the Technical Service Manual Oce 9400? The Service Manual Oce 9400 is one of the tools you will need for your work. It will enable you to meet customer requirements better, quicker and in a clearly structured and accessible way. The Service Manual provides you with information you will require for installing and carrying out corrective and preventive maintenance on this machine. At whom is the Service Manual Oce 9400 targeted? This Service Manual has certainly not been written as a teach-yourself manual. The Service Manual also gives you an opportunity to broaden your knowledge on how the machine functions. The compilers of the Service Manual hope that you will find adequate information so that you can do your work quickly, correctly and with a continuing sense of satisfaction. Greader Exe file requires Windows XP x32. Not higher versions and not x64. I did not use the printer Epson Pro 4900 for a long time and even after 5 or 6 powerful manual cleanings for all inks the paper was staying completely white !! I did the Ink Charge and cleaning process described in the soft and after that the machine is working 100% fine In France there is no way to get this software except if you work for Epson !! !